-100% refund: 15 days before your scheduled arrival. -50% refund: 10 days before your scheduled arrival. -5 days~scheduled arrival: No refund, no any other option. *Let us know at least 10 days before check-in date if you want to change your booking. The following group types are not accepted by this hostel: Stag/Hen/Bachelor Party, Sports Group If you have misrepresented the type of group you are booking for, your booking may be cancelled by the hostel." our guesthouse is homestay style cozy house. 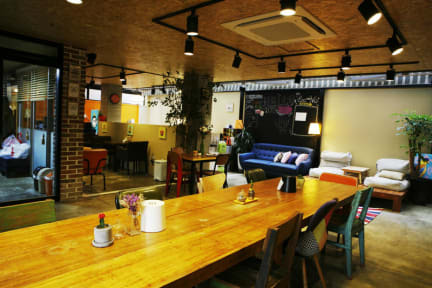 The best accommodation in the middle of Hongdae which is the hottest place of Seoul. Our cozy, comfy, and very spacious studios&apartments give you an absolute relaxation. Every rooms of LEE&NO has a a private bathroom with kitchenette. We provide towels and toilet paper, simple basic amenity(Shampoo, body wash, rinse). 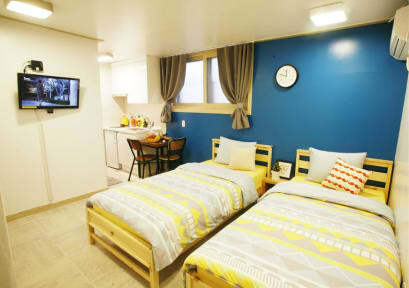 There're basic kitchen utensils, fridge, TV, A/C in the rooms! The breakfast fee is already included. If you arrive at 3pm-6pm, We can help you to check-in. After 6pm, we will send you self-check in information by email.